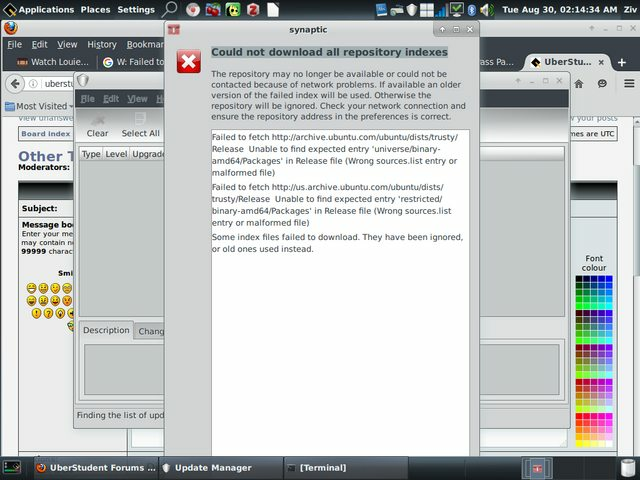 UberStudent Forums • View topic - update manager "Could not download all repository indexes"
update manager "Could not download all repository indexes"
Post subject: update manager "Could not download all repository indexes"
this is the error i get please tell me if you need further info to help me troubleshoot the problem. This usually goes away in an hour, usually less, sometimes more. It's a server in the process of being synced, or something similar. It usually clears up on its own. If it doesn't by the time you read this, try running the Update Manager again after clicking "Refresh," updating everything available to update, and then please run Applications menu > System > Administration > Fixes > Software System Fixer. Let me know if it's still happening afterward.